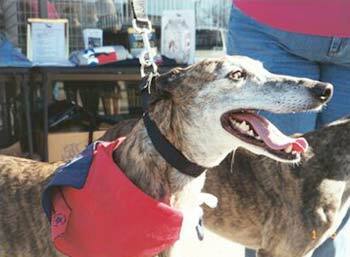 Sadie, aka HR's Sweetie, is a lovely 7-year-old brindle female greyhound, born June 24, 1995. Sadie has been in a home for about two years, and was released to GALT from her previous owners after moving to Dallas from Oregon. 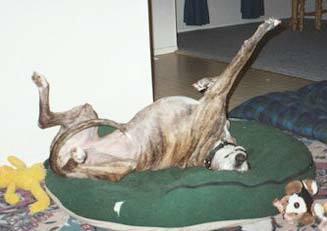 Sadie is laid back, sweet, affectionate and gets along well with other dogs, large and small. She is cat tolerant, and knows several obedience commands already - being very smart and food orientated she is quickly trainable. Sadie loves to play with her toys, and will make an excellent addition to some lucky family.